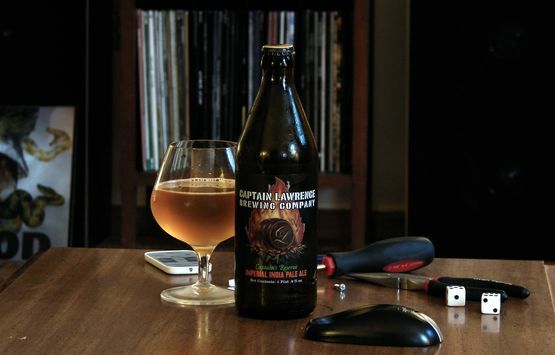 It's easy to overlook the fact that the Captain's IPA is a hefty 9% ABV, because it tastes like such a damn good 'regular IPA.' So it is also therefore a damn good imperial IPA — and I guess that could be good or bad, depending whether you were planning on driving anywhere after drinking it. Eventually, you can pick out the boozy touches. But the Captain's Reserve IPA is easily one of the better versions of the style given how smoothly it matches its booze level with a crisp, dry mouthfeel. Unlike many other 9% beers, the malts don't gang up to drown out the hops, and the sweetness is kept fully in check. That's a double blessing, because a fresh bottle of this boasts a big, hoppy aroma, with a focus on dank, herbal hops, pine, and citrus peel. The flavor is a nice mesh between the grapefruit and pine of western IPAs and the dank resin of East Coast IPAs. It's not the juiciest, most aromatic, most unique hop profile out there; but it's solid, all the way. Neither excessively rich nor excessively bitter, this serves to make it even more drinkable. Do you want a 9% ABV IPA to be drinkable? That's up to you, I guess, and Captain's Reserve IPA isn't something you're going to knock back like Flower Power or Heady Topper. It's just a bit past that point, where you start to feel it quick. It's a great beer, but maybe not a go-to beer like those two. But whenever you drink it — get it fresh. Availability: 16 ounce bottle. Year round. You should definitely check it out. It's a great brewery, with a nice bar for samples and a very informative tour.